My computer was broken when Doom came out. There I was, with this shiny, super-fast 486 DX2-66 that my dad had bought from the computer company he shared his offices with, and it was friggin’ broken while all of my highschool friends were excitedly sharing stories about how cool this new “Doom” game was. I had never paid much attention to Wolfenstein 3D, preferring the more “sophisticated” RPG games of the time, but Doom was impossible to ignore. PC Player loved it, my friends were loving it, and I, too, was aching to play. 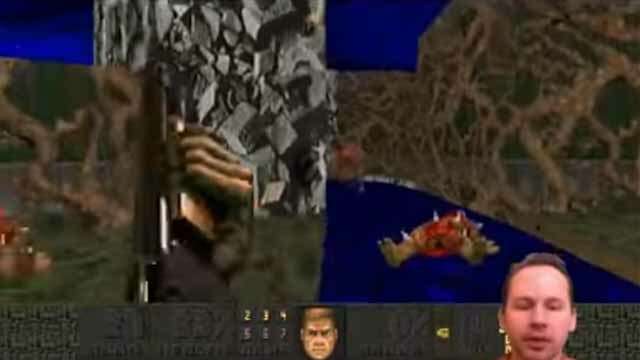 Doom didn’t just look like a dumb shooter game that I could pass on in favor of the likes of Ultima Underworld. 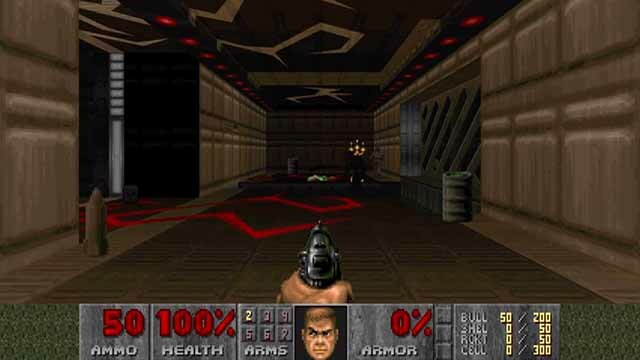 Doom was an irresistible high tech horror techno dungeon. Of course I joined the fray as soon as my PC returned from what would turn out a boot sector virus-induced hiatus. A short while later, my neighbor and I were regularly carrying our computers and monitors back and forth so that we could play coop and deathmatch via null-modem cable. Doom added a whole new set of words and experiences to our gaming vocabulary: terms like “fragging” and “coop play” had never existed for us until we played Doom. Doom was cool. Initially, Doom 2 didn’t live up to that experience. 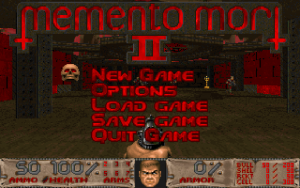 It was more of the same, and I found the level design to be lacking; in fact, I have never finished a playthrough of the original Doom 2 campaign. (Shocking but true.) 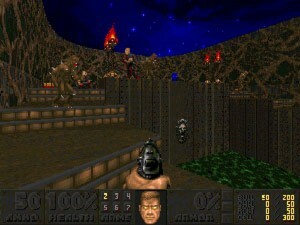 When I bought my first modem in 1995, my friend and I had moved on to playing Heretic deathmatch instead. The first level I ever made after downloading WadEd from was actually a Heretic map. Nothing ever came of it, it was just a test room with a bunch of walls and objects. But of course I was hooked on making these maps immediately – years of using the 3D Construction Kit and playing dungeon crawlers had laid that foundation. My optimism was boundless, my confidence unshakable. Of course I could make levels that were just as good as the official Doom maps. Of course my levels would be the best custom maps out there. I wouldn’t release anything less. That cockiness must have been annoying to my friends and contemporaries, but with this self-assurance also came the benefit of high standards. I took pride in what I did, never quite believed that my work was good enough, and only presented it to the world when I was confident that it might entertain people. 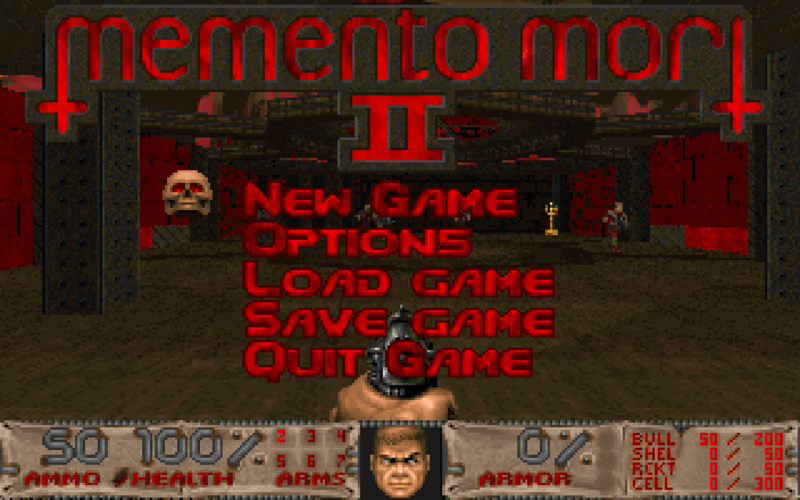 After a couple of years, I had made a highly regarded single player episode (The Troopers’ Playgound) and contributed to the quintessential megaWAD of the time, Memento Mori 2. I was also operating a national Doom deathmatch league via the FIDONet DOOM.GER forum. Several friends and I threw regular LAN parties in which we played deathmatch all night. Doom 2, after the brief initial let-down, was a major part of my life, and those were fun times. Memento Mori 2. This isn’t my level, but it shows the new stat bar I worked on for many weeks (Thomas Moeller added some extra magic). There’s many reasons why Doom had such a strong editing community, not the least of which was its unprecedented modability. 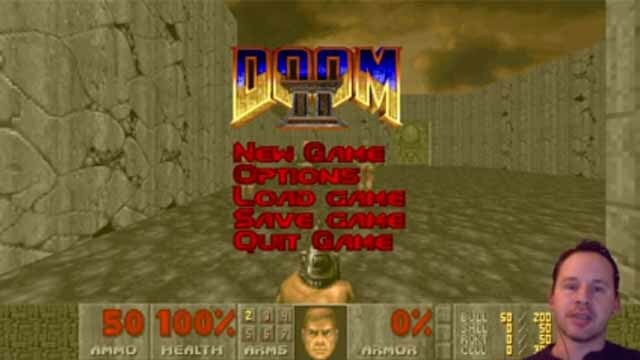 Superb 3D graphics and visceral gameplay had drawn us in, but the enemy/weapon design was the real reason for Doom’s longevity as a single-player game: Doom had a finely tuned bestiary of differing enemy classes and projectile types, with almost infinite potential for creating new combinations. 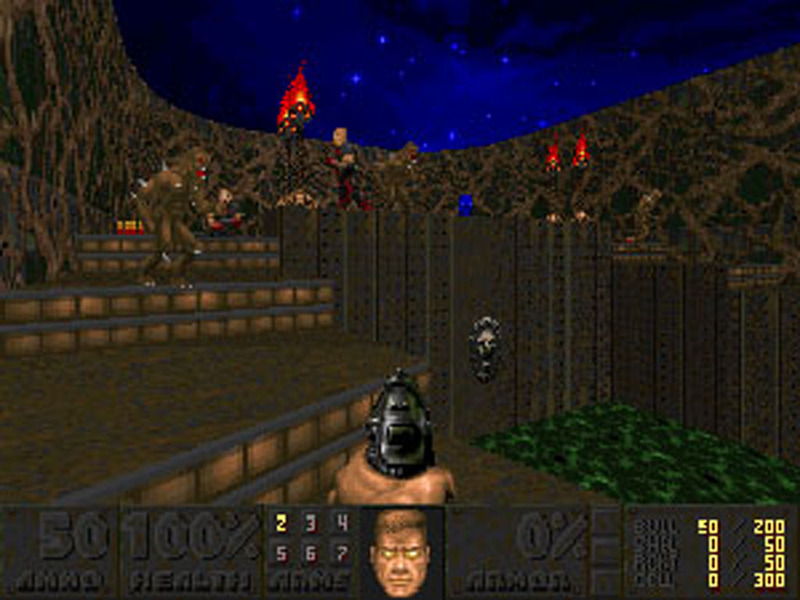 There were weak enemies with hit-scan weapons that could take out the player from across the room. And there were enemies with slow-moving projectile attacks that could be dodged by the skilled player. 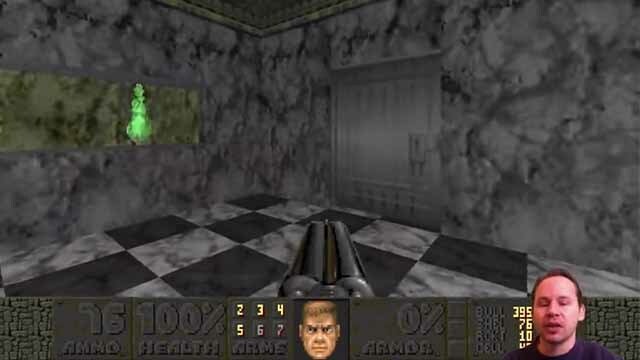 Every time you opened a door in Doom, you would scan the room and create a plan of attack for that area, changing weapons according to the enemies you were fighting and the order you wanted to eliminate them in. Shotgun zombies in the back of the room and a Cacodemon (“flying tomato”) in the front? No Problem! Just position yourself between the Cacodemon and the Zombies and whip out the chaingun! The zombies would shoot the demon in the back, and as you unleashed a hellfire of bullets on the Cacodemon he’d have almost no chance to ever even shoot back. Then you’d change to the single barrel shotgun to take out the zombies in the back. We had a lot of fun mixing things up, and the best Doom single-player maps kept pushing this highly refined interplay of enemies and weapons to heights never imagined. To this day the supposed spiritual successors of Doom have not reached the same level of depth. Sure, Serious Sam knew how to throw tons of enemies on the screen. 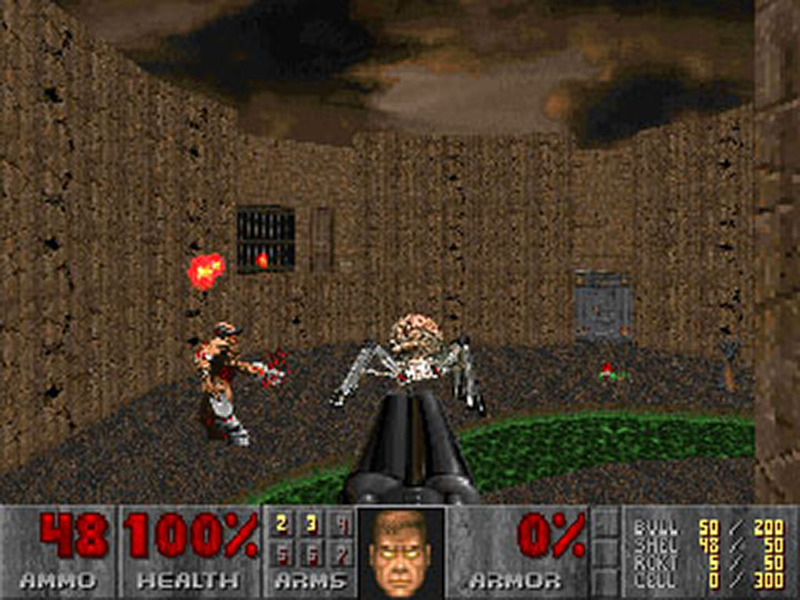 But it did not come close to Doom’s level of enemy and weapon interplay. I was hanging on to Doom editing as long as I could, and fittingly my last editing work would show up in Requiem, which arguably turned out to be the swan song of the traditional Doom editing culture. There’s plenty of reasons why Doom has such a strong legacy, and even today people are still playing the levels. This page is dedicated to everybody who was part of the great Doom era of the 90s. It is dedicated to those who are just now discovering the game for themselves. And it is dedicated to everybody who is keeping the legacy alive. 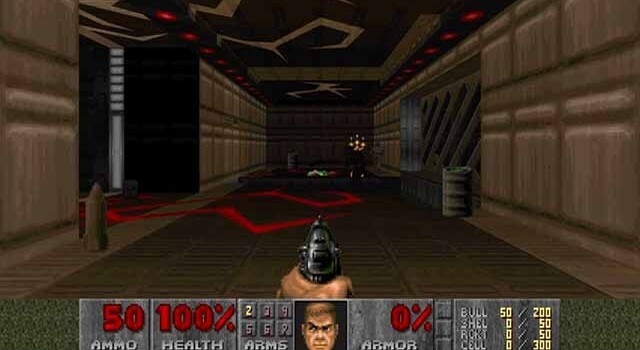 Doom spawned countless professionals who are now major contributors to the gaming industry. Its lessons still inform my fundamental ideas on game design. I hope we all keep enjoying the game (and that we keep learning from it)! Requiem was a troubled production. Several team members, including the moderator, dropped off the face of the Earth for intermittent periods. When it was finally released it was branded as a beta, and I don’t think there ever was an update. Despite its troubled history and late release, Requiem is a really good map pack with some impressive levels by the greats of the Doom editing. It was included in DoomWorld’s Top 100 WADs Of All Time. I created 4 levels for Requiem. The second MM “mega-WAD”, which brought together ~20 of the best level designers of the time (many of which are working in the industry these days). I made four levels for this. Included in DoomWorld’s Top 100 WADs Of All Time. This was a quick beautifying pass of a pre-existing level. Looking back at the level in 2008, I’m not sure why I did it. There isn’t much gameplay here. But I guess the level has historical value. My Doom 2 episode. Nine levels with new textures, a new enemy type and some Dehacked work. Included in DoomWorld’s Top 100 WADs Of All Time. I recorded a level retrospective about these levels in two parts: here and here.